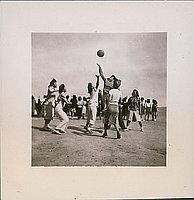 1 photographic print : b&w; ; image 2.125 x 2.125 in., on sheet 3.125 x 3 in. 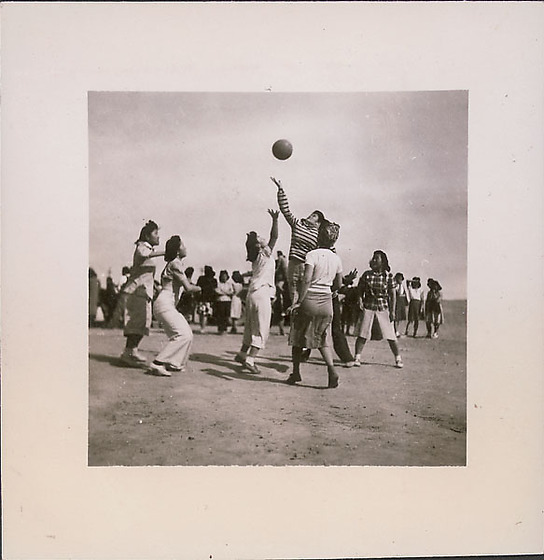 Seven girls playing basketball at Heart Mountain concentration camp, Wyoming, 1943. Two girls are in process of jump ball while other five players look on. They are dressed in skirts, pants and pedal pushers. Playing in open field, grassy area, spectators in background.